Abstract: The National Cancer Institute has an active research program investigating geographic patterns of cancer in the U.S. 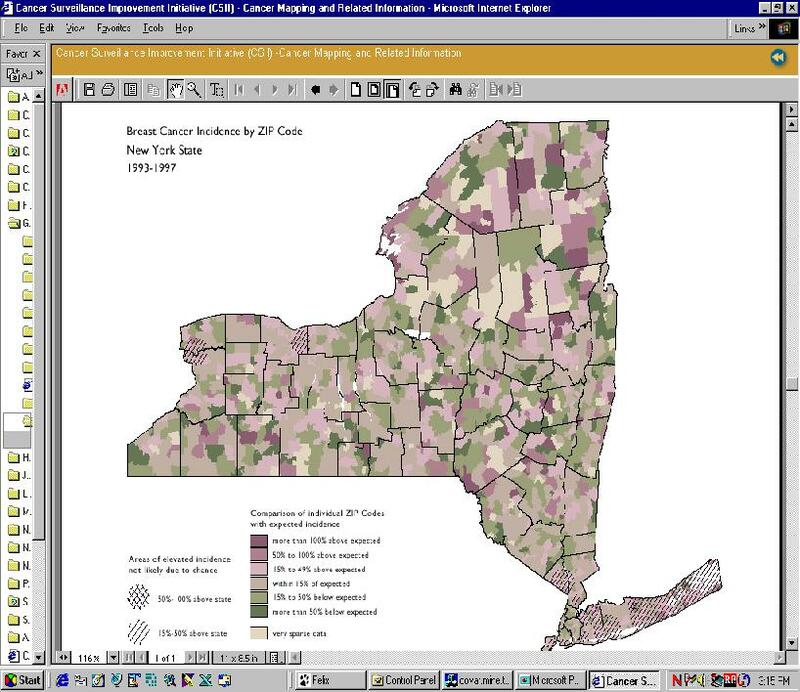 In this talk, we describe the development of a complex GIS (Long Island), use of GIS to estimate exposures for environmental epidemiology studies, statistical analyses incorporating spatial information, and the use of maps to communicate cancer statistics. The National Cancer Institute (NCI) has a long history of mapping cancer data, having published a series of atlases that led to significant advances in understanding the regional differences of cancer rates in the U.S. (Mason 1975; Mason 1976; Mason 1981; Pickle 1987; Pickle 1990; Devesa 1999) Although mortality rates had been published for decades in tabular form, it wasn’t until Mason and colleagues mapped the rates at the county level that striking geographic patterns were evident. For example, high lung cancer mortality rates that were seen in coastal cities were later found to be due to asbestos exposure from shipyard work during World War II (Blot 1978). Also, high oral cancer rates among white women in southeastern states were found to be caused by their habit of dipping snuff (smokeless tobacco) (Winn 1981). With improvements in computer hardware and widespread availability of software for geographic information systems (GIS), mapping is no longer limited to academic cartographers or to national agencies with extensive computer resources. The role of NCI, for example, has changed to one of facilitator for localized geographic studies and developer of geographic methods widely applicable to cancer data, in addition to its traditional role of producing national statistics and conducting studies to determine the cancer causes and effective prevention, diagnosis and treatment. GIS itself is comprised of three general areas: database development (building the GIS), spatial analysis and visualization of georeferenced data. In this paper, we present examples of ongoing work at NCI in each of these areas. An example of a complex GIS is one NCI is developing for Long Island, NY. The northeastern U.S. has had high rates of breast cancer mortality for many years. 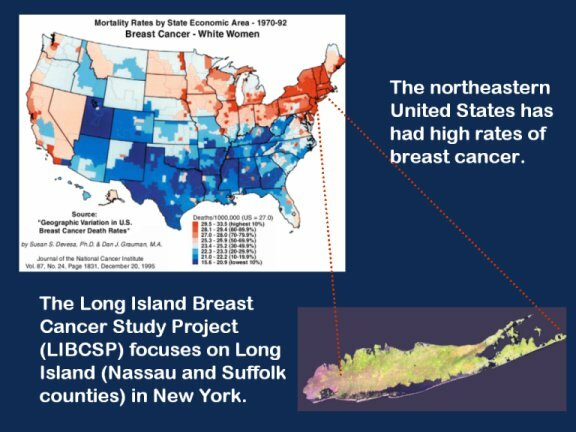 The Long Island Breast Cancer Study Project grew out of the community’s concern about possible environmental causes of the high breast cancer rates there (Figure 1). In response to this community concern, Congress passed a law in 1993 directing that research be conducted on environmental factors that may contribute to breast cancer risk, and mandated the creation of a GIS for breast cancer studies on Long Island. 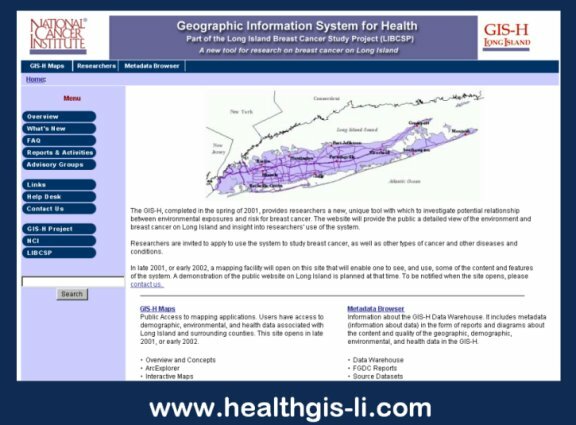 This health GIS (GIS-H) focuses on Nassau and Suffolk counties (Long Island), New York. However, additional environmental data are included with less detail and geographic precision for areas 50 kilometers from the two counties, and within a 100 mile radius from the mid-point of the boundary line between the two counties. The extended area includes counties in New York, Connecticut, New Jersey, New York, Pennsylvania, Rhode Island, and Massachusetts. The GIS-H includes a rich data warehouse of over 80 datasets, such as air quality, demographic data, hazmat sites, industrial facilities, radioactive sites and water quality. It is flexible and expandable to better respond to research needs. As additional relevant exposure data become available, they will be added to allow researchers to explore important exposure-disease relationships. A number of analytic tools have been added as extensions to the basic system, ranging from a simple rate calculator to cluster and empirical Bayes analysis tools. This system is expected to be released this winter, after which interested researchers are invited to submit proposals to use these data. More information is available at the web site http://www.healthgis-li.com (Figure 2). A GIS can be a useful tool for estimating exposure to environmental contaminants by providing information about potential exposures that cannot be obtained through traditional epidemiologic methods. 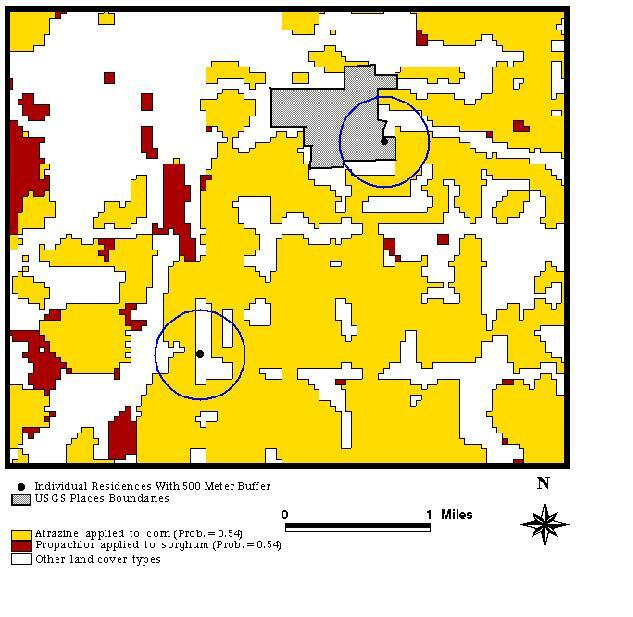 We used a GIS to estimate indirect exposure to agricultural pesticides and nitrate levels in private wells in two cancer epidemiology studies. 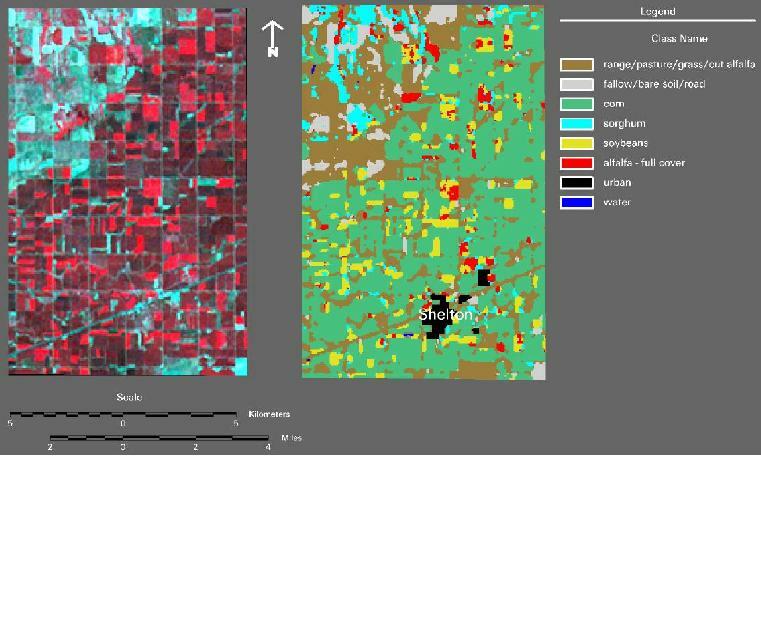 In the first study, we used satellite imagery to reconstruct historical crop patterns in south central Nebraska using historical Farm Service Agency records as a source of ground reference data (Ward et al., 2000) (Figure 3). Residences from a population-based epidemiologic study of non-Hodgkin's lymphoma (NHL) were mapped in the GIS. Corn, soybeans, sorghum, and alfalfa were the major crops grown in the study area and 22 percent of residences had one of these crops within 500 meters of the residence, an intermediate distance for the range of drift effects from pesticides applied in agriculture. We estimated probable exposure to crop pesticides by assessing the proximity of residences to specific crop species, and assigning probabilities of pesticide use based on available pesticide use data (Ward et al., 2000) (Figure 4). This study demonstrated that by using a GIS, zones of potential exposure to agricultural pesticides and proximity measures can be determined for residences in a study. We are currently using the same method to estimate probable exposure to pesticides in a NHL study in Iowa, and in a childhood leukemia study in California. In both of these studies, we are measuring levels of pesticides in carpet dust samples from the participants residences in order to calibrate and validate the GIS-based exposure metric. In the second study, we are using a GIS to estimate exposure to drinking water nitrate for census block groups (average population = 1000) in the Platte River Valley of Nebraska and northern Colorado. Nitrate levels for water supplied by utilities in the study area were obtained from the respective State Health Departments. We matched census block group populations to utility-based nitrate levels using a GIS-based matching procedure developed at Colorado State University (Small et al., 2001). The procedure matches on utility name, township name and location, and/or on location of utility-specific point locations in the water distribution system. We are using a GIS-based statistical modeling approach (Nuckols et al., 2000) to estimate nitrate levels for census block groups where the population uses private wells as a water supply. Our approach is based on a method reported by Drunliner et al. (1996) by which nitrate levels in wells located in the High Plains Aquifer of Nebraska were predicted based on land-use and geophysical variables in a zone of hydrologic influence around each well. We used remote sensing and GIS technology to locate and quantify 12 different geophysical and land use variables related to nitrate transport in ground water for the period 1990-2000. We are currently in the process of calibrating and validating this model using measurements of nitrate in wells in the 1990s. We will calculate exposure metrics for each census block group based on the nitrate levels in public and private supplies weighted by the population served. We will evaluate the association between the nitrate exposure metrics and cancer incidence rates from 1990-1999. NCI is active in the development and use of methods for spatial data analysis. Software to detect and evaluate the statistical significance of spatial or space-time disease clusters is available on our web site (SaTScan at http://srab.cancer.gov/othersoft.html; Kulldorff 1997a). This software has been used, for example, to identify significant clusters of high rates of several cancers at the zip code level in New York (Figure 5) and has been used numerous times to evaluate cancer clusters brought to our attention by the public (Kulldorff 1997b, Kulldorff 1998). We are currently working to extend this program to detect elliptical clusters; the current version detects circular clusters. Multilevel hierarchical statistical models are being used for a number of applications at NCI. One major project is the prediction of the number of new cancer cases expected in states without a tumor registry (Pickle 2001). Poisson models are used to predict cancer incidence from cancer mortality and sociodemographic and lifestyle covariates for the counties with registries, then the results are applied to other counties to make predictions on the basis of their mortality and covariate data. Tables and maps by state will be first published next year for the four most common cancers. Plans are to expand the project to include non-NCI-sponsored registries’ data in the future and to report on more types of cancer. A more standard type of spatial analysis is exemplified by a study of the geographic patterns of late stage breast cancer in Los Angeles county (Figure 6). Here, we modeled the proportion of all incident breast cancer cases in the county who were diagnosed with late stage disease for the purpose of identifying population subgroups and geographic areas that could benefit from additional mammographic screening. For this study, a “late” diagnosis was defined as distant stage at diagnosis, or regional stage with tumor size greater than 1 cm. The multilevel logistic model included covariates specific to the individual and her tumor as well as socioeconomic characteristics of the census tract where she resided at the time of diagnosis. A GIS was used to compute distance between the census tract centroid for each case and the nearest mammographic facility and this distance was also included as a predictor. Because of the requirement to maintain confidentiality of cancer patients, this cancer registry only provided a patient’s census tract location as a geographic reference for analysis. The analysis plan was to use geographic centroids for the census tracts provided on the CensusCD+Mapsä as a surrogate for the location of cancer cases. However, the centroids for most tracts along the coastline were actually in the water because these centroids were based on polygons that included state waters (“centroids off shore” in Figure 7). In order to have a more accurate location for residences of cancer cases, centroids were determined based only on the onshore portions of the tract polygons using an ArcView script (“centroids on shore” in Figure 7). The large size of tracts in the northern half of the county suggested that perhaps population centroids would better reflect the distance to facility for most residents. LandScan estimates the spatial distribution of residential populations using census data and other geospatial data such as land use/cover, slope, topography, roads and nighttime lights. 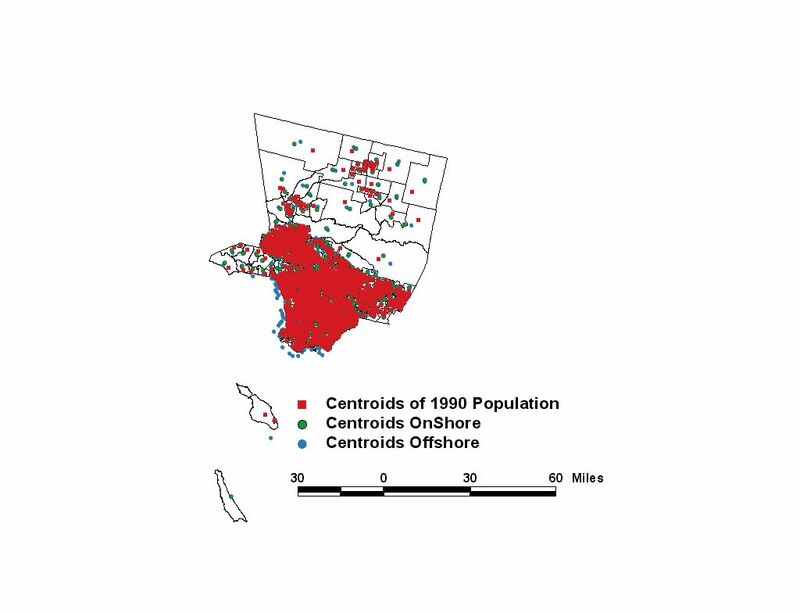 Centroids for census tracts were based on the population distribution at a resolution of 15 minutes, about 450 meters (“centroids of 1990 population” in Figure 7). These were little changed for the urban tracts but were relocated onshore for the coastal tracts and relocated closer to the developed areas for the more rural northern tracts. Exploratory spatial data analysis tools are a hybrid of analytic and data visualization tools. NCI is taking an active role in the development of such tools through in-house research, small contracts with university researchers, and participation in a grant from the National Science Foundation for Digital Government Quality Graphics. Innovative graphical designs are evaluated using focus groups, usability tests and cognitive experimentation. Examples include parallel coordinate plots linked to maps (MacEachren 2001), micromap plots of linked panel graphs and maps (Carr 1998), conditional choropleth maps (Carr 2000) and animated maps (MacEachren 1998). These interactive graphical tools allow the researcher to explore the geographic patterns in the data over time or in conjunction with graphs of related statistics. For example, Figure 8 shows an ordered graph of lung cancer mortality by state alongside a graph of the proportion of residents who ever smoked cigarettes. These graphs are visually linked to geographic location by color coding on the small maps to the left of the graphs. The maps can be used as an index by finding the place on the map first, then reading across to find the statistical values for that state. Alternatively, the reader can start by examining the values of the cancer rates or behavioral factor, then looking for clusters of states that rank similarly on the graphs. Another new exploratory tool is the conditioned choropleth map, where a single choropleth map of cancer rates is decomposed into several separate maps according to values of other characteristics of the places (Carr 2000). For example, Figure 9 shows lung cancer mortality rates for older white males stratified by the proportion of residents living below poverty and by the area rainfall amount. This interactive graphic can be used to explore the associations of low income and damp weather conditions on lung cancer rates. Slider bars allow the user to try different cutpoints for all the variables in order to focus on patterns of interest. In addition to designing tools that are useful to researchers, there is a need to communicate georeferenced data to policy makers, clinicians, patients, and the lay public. We are conducting research in the area of data visualization, a continuation of work begun at the National Center for Health Statistics for paper maps and graphs, which is now being extended to computer-based presentation. A major project where we are applying this research is the State Cancer Profiles Project, a web-based system that characterizes the cancer burden in each state. Interactive graphs and maps will be used to visually support decisions on where to focus cancer control efforts. Thus this system is targeting cancers for which effective screening or prevention interventions are available: stop smoking campaigns for lung cancer, screening for colorectal, breast and prostate cancer, sun avoidance education for melanoma of the skin. This system will integrate surveillance data with cancer control planning, characterize geographic areas and demographic groups in each state and identify potential health disparities. Several of the exploratory spatial data analysis tools are being tested for inclusion in this web-based system. Conditional choropleth maps are being used, for example, to show the geographic distribution of counties within a state that have high versus low cancer mortality rates cross-classified with the direction of change in these rates. Challenges in communicating information graphically for the State Cancer Profiles Project include ensuring correct interpretation of the statistics by a diverse audience and complying with Section 508 (29 U.S.C. ‘794d). In 1998, Congress amended the Rehabilitation Act to require Federal agencies to make their electronic and information technology accessible to people with disabilities. The technical standards took effect June 21, 2001 (http://section508.gov/). By their nature, geographic information systems are visual but now we have the challenge of ensuring that the visually impaired also have access to the information displayed in maps. The new website for the latest NCI cancer atlas (http://cancer.gov/atlasplus/) may be the first web site at NIH to be compatible with Section 508 requirements. 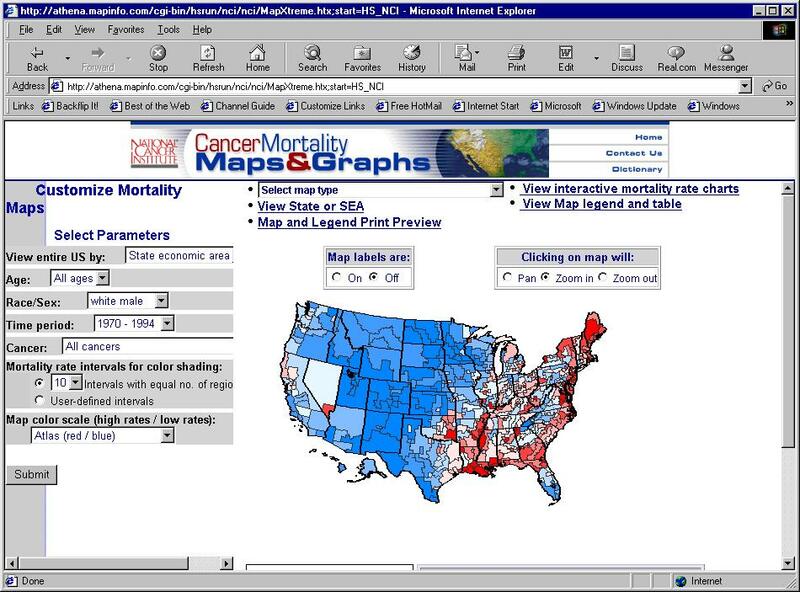 This site provides more information than was included in the printed atlas (Devesa 1999), including interactive maps, graphs (which are accessible to the blind and visually-impaired), text, tables and figures showing the geographic patterns and time trends of cancer death rates for the time period 1950-1994 for more than 40 cancers (Figure 10). several research projects in the area of environmental assessment plus a statistical methods and a software development project. A second round of grants has just been reviewed and will likely be awarded within the next few months. Although re-issuance of this PA is uncertain, we wish to encourage researchers to apply for funding in this area through the regular NIH funding channels. The spatial analysis of cancer will remain an area of great interest for the institute. Blot WJ, Harrington M, Toledo A, et al. Lung cancer after employment in shipyards during World War II. New England Journal of Medicine 299:620-4, 1978. Carr DB, Wallin JF. Carr DA. Two new templates for epidemiology applications: Linked micromap plots and conditioned choropleth maps. Statistics in Medicine 19:17-8, 2000. Carr DB, Olsen AR, Courbois JP, Pierson SM, Carr DA. Linked micromap plots: Named and described. Statistical Computing & Graphics Newsletter, Vol 9 No 1. pp. 24-32. 1998. CensusCD+Maps, GeoLytics, Inc., East Brunswick, NJ. Devesa SS, Grauman DG, Blot WJ, Pennello G, Hoover RN, Fraumeni JF Jr. Atlas of cancer mortality in the United States, 1950-94. Washington, DC: US Govt Print Off, 1999. [NIH Publ No. (NIH) 99-4564]. Drunliner AD, Chen HH, McGrath TS. Relations of non-point source nitrate and atrazine concentrations in the High Plains Aquifer to selected explanatory variables in six Nebraska study areas. Water Resources Report 95-4202. U.S. Geological Survey. Lincoln, Nebraska. 1996. Kulldorff M: A spatial scan statistic. Communications in Statistics: Theory and Methods, 26:1481-1496, 1997a. Kulldorff M, Feuer EJ, Miller BA, Freedman L. Breast cancer clusters in northeastern United States: A geographical analysis. Amer J Epidemiol 146:161-170, 1997b. Kulldorff M, Athas WF, Feuer EJ, Miller BA, Key CR. Evaluating cluster alarms: A space-time scan statistic and brain cancer in Los Alamos. Amer J Public Health 88:1377-1380, 1998. LandScan: A high resolution population distribution model. Oak Ridge National Laboratory, U.S. Department of Energy, http://www.ornl.gov/gist. MacEachren AM, Boscoe FP, Haug D, Pickle LW. Geographic Visualization: Designing manipulable maps for exploring temporally varying georeferenced statistics. Proceedings of the IEEE Information Visualization Symposium, Research Triangle Park, NC, Oct. 19-20, 1998, pp. 87-94. MacEachren AM, Hardisty F, Wheeler M, Gahegan M, Dai X, Guo D, Takatsuka M. Supporting visual integration and analysis of geospatially-referenced statistics through web-deployable, cross-platform tools. Proceedings of the National Conference for Digital Government Research, Los Angeles, CA, May 21-23, 2001. Mason TJ, McKay FW, Hoover R, et al. An atlas of mortality from selected diseases. Washington: USGPO (DHHS pub no (NIH) 81-2397), 1981. Mason TJ, McKay FW, Hoover R, et al. Atlas of cancer mortality among U.S. nonwhites: 1950-1969. Washington: USGPO (DHEW pub no (NIH) 76-1204), 1976. Mason TJ, McKay FW, Hoover R, et al. Atlas of cancer mortality for U.S. counties: 1950-1969. Washington: USGPO (DHEW pub no (NIH) 75-780), 1975. Nuckols JR. Estimating Exposure to Nitrate and Pesticides in Drinking Water in the Platte River Valley. Contract P896943 – NCI-OEB. Westat, Inc. Rockville, Maryland. 2000. Pickle LW, Mason TJ, Howard N, et al. Atlas of U.S. cancer mortality among whites: 1950-1980. Washington: USGPO (DHHS pub no (NIH) 87-2900, 1987. Pickle LW, Mason TJ, Howard N, et al. Atlas of U.S. cancer mortality among nonwhites: 1950-1980. Washington: USGPO (DHHS pub no (NIH) 90-1582, 1990. Pickle LW. Prediction of incident cancer cases in non-SEER counties. Proceedings of the Biometrics Section of the 2000 Annual Meeting of the American Statistical Association, 2001, p. 45-52. Small L, Maxwell S, Ward MH, Nuckols JR. Using technology to investigate the association of land use and exposure to nitrates. Abstract. Proceedings: 3rd Intl Conf geospatial Information in Agriculture and Forestry. Nov 5-7, 2001, Denver, Colorado. Veridian, Arlington, VA. 2001. Ward MH, Nuckols JR, Weigel SJ, et al. Environmental Health Perspectives 108:5-12, 2000. Winn D, Blot WF, Shy CM, et al. Snuff dipping and oral cancer among women in the southern United States. New England Journal of Medicine 304:745-9, 1981. Figure 3. Original Landsat image (left) and the land cover map (right) for a region of Buffalo county including Shelton, Nebraska (Ward et al. 2000) . Figure 4. Probable exposure to crop pesticides at individual residences (Ward et al. 2000). Figure 6. Proportion of new breast cancer cases with late stage at diagnosis in Los Angeles county. Figure 7. A comparison of geographic and population centroids for census tracts in Los Angeles county. Figure 8. 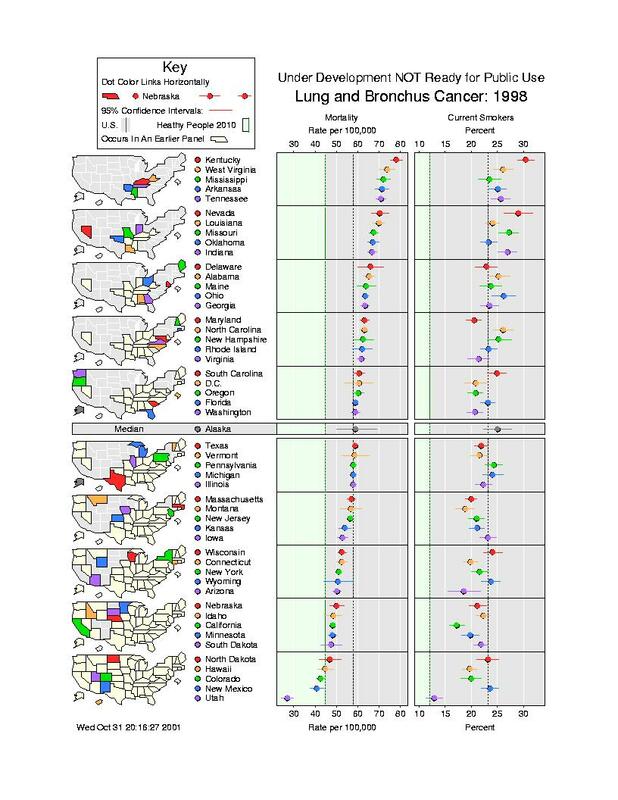 Sample micromap plot of lung cancer mortality rates linked to smoking information by state. Figure 9. Sample conditioned choropleth map of lung cancer mortality rates stratified by degree of poverty and rainfall. Figure 10. Customizable map selection on the NCI Atlas web page.